Boomworks are an IT firm of approximately 25 people specialising in the design and user-testing of websites. In 2009, the company bought a 300sqm single storey warehouse in Camperdown, NSW, and approached SHED to review options for relocating their business to that space. The resulting brief warranted a creative workspace for 25 to 30 people with support facilities, website testing ‘labs’, as well as outdoor breakout spaces. 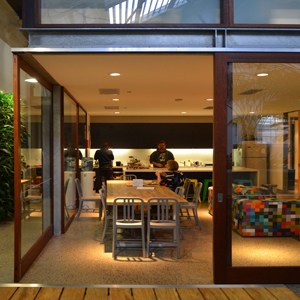 In response, SHED delivered a unique and innovative concept that provided a new workspace for their clients while maximising sustainability initiatives. The idea was to build a timber and glass box inside the warehouse, and create a garden around the box. This garden will be used for informal meetings, office gatherings, bike parking and breakout spaces, while the ground floor inside the box contains meeting rooms, a lunch room, and other testing and service areas. Designed for its surrounding climate, the building adopts a mixed mode air conditioning strategy that relies on the local mild temperatures that are ideal for natural ventilation. At the same time, a control strategy was developed to allow the mechanical systems to operate only when necessary. The spaces inside the box are air conditioned, but when conditions are right, the building can operate in natural ventilation mode, whereby cool air is drawn in by natural convection through the existing windows. During warmer weathers, this natural ventilation system is used for night-purging. Boasting a reduced reliance on mechanical air conditioning from 100 percent to 25 per cent after moving to its new premises, Boomsworks is a successful example of the adaptive reuse of an existing industrial warehouse as a high quality conditioned workspace.